:The teen years can be a time when relationships are challenged and hard questions about life are asked. They're also a time when role models who stand for truth are needed most. In Made to Shine, sisters and coauthors Becca Leander Nicholson and Elissa Leander Tipps present an exciting devotional journey that points teen girls to Jesus-the ultimate shining star. Each day for a month, you'll find an engaging devotional reading that shares a real, honest story about Becca and Elissa's experiences as teens and their passion for Christ. You'll also find questions for reflection, suggested songs for worship, and space to journal your thoughts and prayers. Throughout the pages of this fun and creative devotional, you'll be reminded that you are chosen, loved, and empowered by God to shine in the light of His glory. 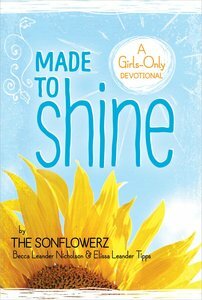 About "Made to Shine: A Girls-Only Devotional"